Spring is around the corner and we are getting so excited to start serving more fresh, spring-y recipes. ‘Tis the season for all things green! In the process of rounding up some amazing food to share with you, we stumbled on what we think is the best pea salad recipe ever. I mean, anything with parmesan and prosciutto is bound to be fabulous, right? This recipe is simple in that it only has a handful of ingredients, but it packs a delicious punch. The freshness and crunch of the peas is heightened with the tangy lemon Dijon vinaigrette. When tossed with the salty prosciutto and earthy parmesan, it culminates into a fabulous blend of flavors that perfectly suits the change of the seasons. 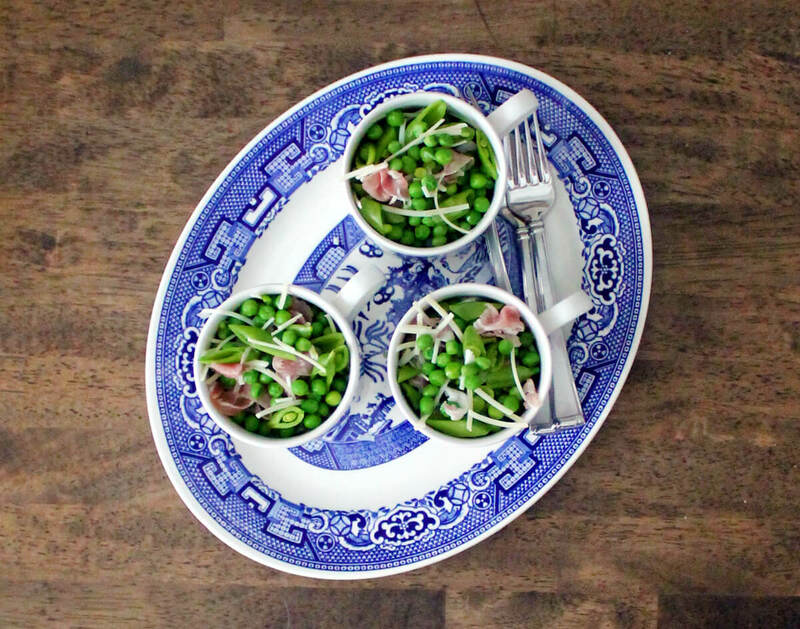 Due to the base of peas in this salad, it is surprisingly hearty — enough to serve it over a bed of fresh greens as a main dish. When served in small portions it is still light enough to work as a side dish or an accompaniment in a lighter menu. 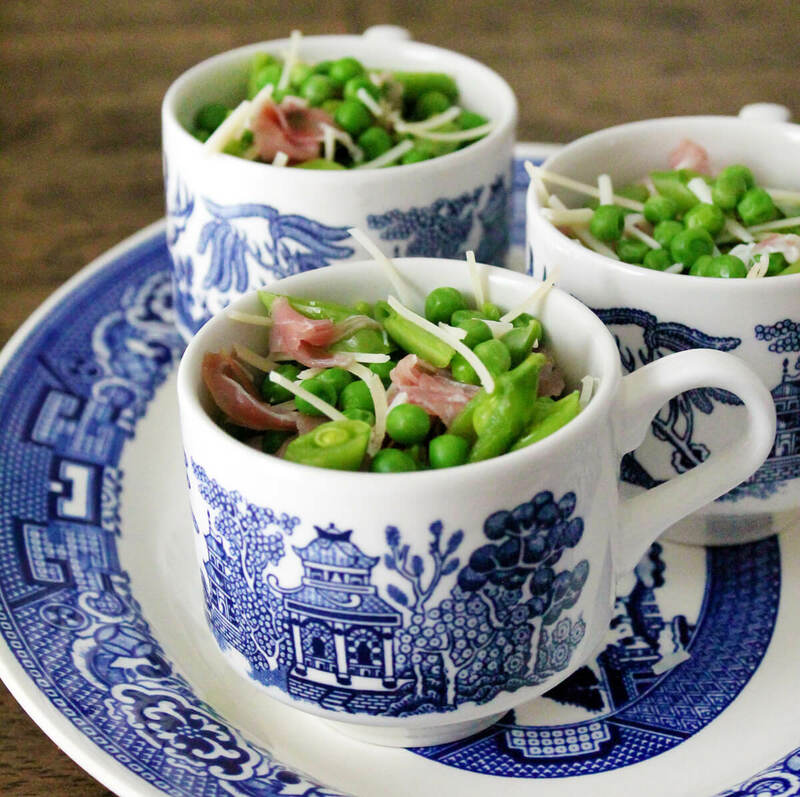 We thought it would be fun to serve our best pea salad recipe ever as the statement dish for a spring-themed afternoon tea party. Accompaniments to this salad would be a creamy potato soup and a simple tea sandwich, such as grilled cheese. Go above and beyond by making a trio of hot tea sandwiches that include a Monte Cristo as well as apple butter ham and cheese. For dessert, lemon meringue bites would be a perfect pairing. Our favorite tea to pair with this salad is Fog Cutter Irish breakfast tea. A black tea with hints of lemon, it plays perfectly into the tangy vinaigrette as well as the dessert without being overpowering for the other dishes. If you are looking for a lighter or lower caffeine tea, our Citrus Mint green tea is a great option. 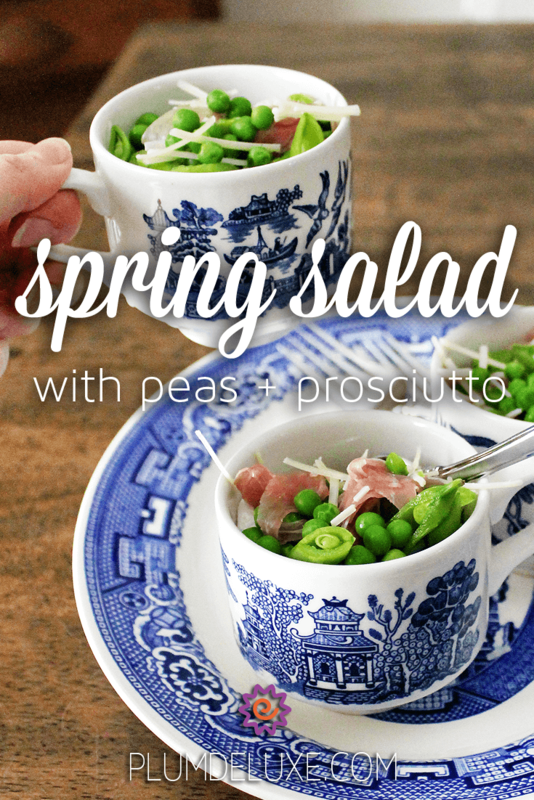 The addition of the mint goes wonderfully with the fresh peas and prosciutto. Whisk lemon juice and mustard in a small bowl. Gradually add oil, whisking constantly until emulsified. Add salt and pepper to taste. In a large bowl, add green peas, sugar snap peas, and parmesan. Pour the vinaigrette over the top and toss to coat. Arrange salad on a platter or individual bowls and top with prosciutto.